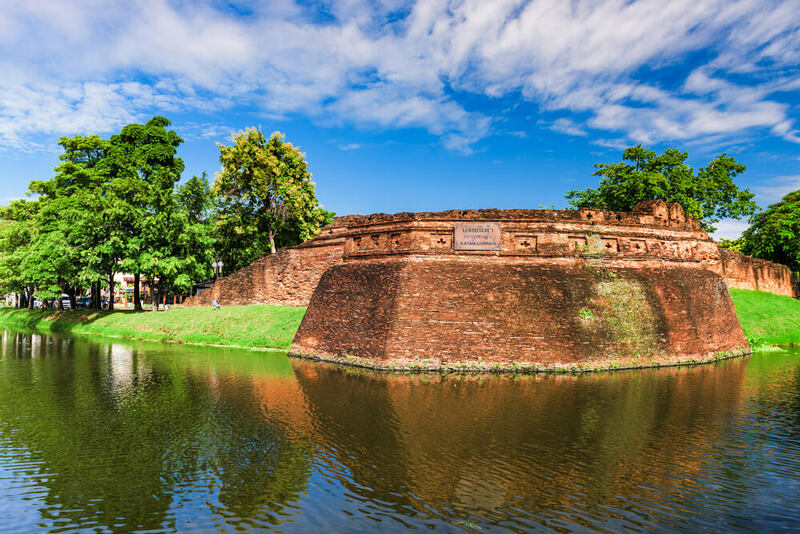 Chiang Mai is the capital city of Northern Thailand and was for many centuries the capital of the Lanna Kingdom until being fully integrated into the more powerful Kingdom of Siam. The city and the provinces surrounding Chiang Mai, however, managed to preserve their local authentic cultures where also deep influences from ethnic minorities such as Karen, Mon or Shan have a deep influence on local believes, handicraft and food. 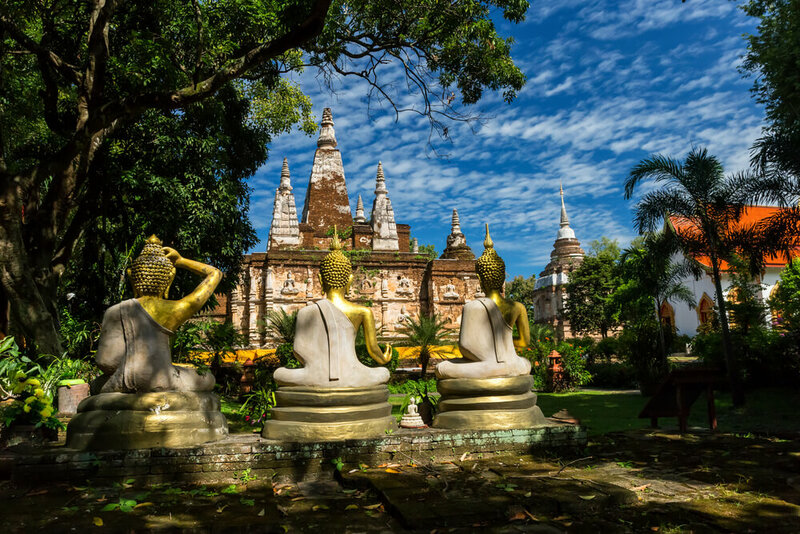 The city centre of Chiang Mai offers lots of attractions with two dozens of temples, ancient teak houses, old city walls, museums, markets, and gardens. Wat Phra Singh temple, located along Sam Lan Road in the historical walled city of Chiang Mai, is one of the largest and most visited places in Chiang Mai, especially for the Viharn Lai Kham with its exquisite delicate wooden sculptures and its sculpture of Buddha. Look also at the amazing elevated library building with its beautifully sculpted walls, the round chedi is inspired by Ceylonese architecture. On Sunday, part of the road running from the temple to Tapae Gate is turned into a walking street with many locals selling delicacies and handicraft. How to get there: The temple is located at the end of Ratchadamnoen Road near the Tapae gate, which is part of the old walls. No tourist come to Chiang Mai without paying a look to Wat Chedi Luang with its huge chedi, as large as 54 metres and as tall as 98 metres. 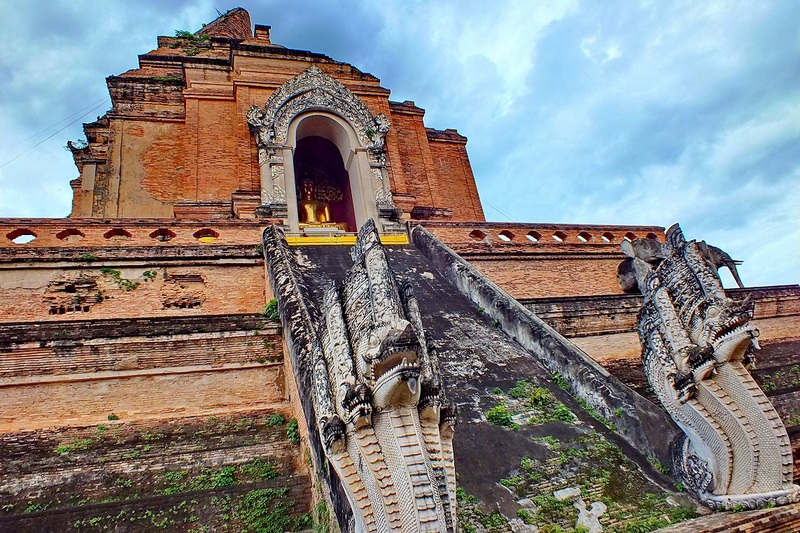 Long sculpted serpents (naga) and elephants’ sculptures surround the chedi and are considered the most beautiful in Northern Thailand. There is a monk corner at the temple where visitors have the opportunity to chat with novices and young monks, helping them to improve their English knowledge. How to get there: Just a few metres away from Wat Phra Singh, the temple is on Prapokklao Road – the main road along a north/south axis. The construction of the temple dates back to 1296 according to experts. Located as well inside the walled historical city, the temple was built with the founding of the town. It is famous for its beautiful Ubosot (main hall) as well as a chedi supported by sculpted by elephants’ buttresses. How to get there: located near to Chang Puak Gate along Ratchaphakhinai Road at the cross section of Sri Phum Road. How to get there: a small street parallel to the highway which rings Chiang Mai, goes to the temple. Follow signage to Huay Kaew road. 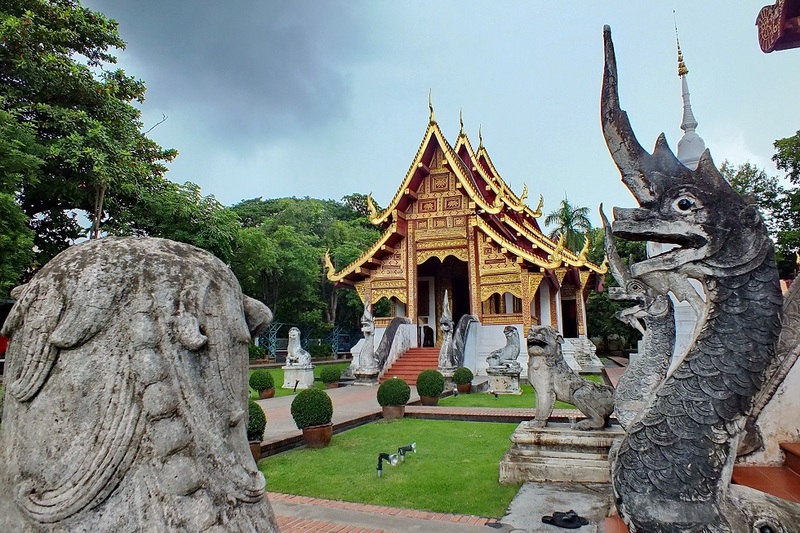 It is also within walking distance of the Chiang Mai National Museum. 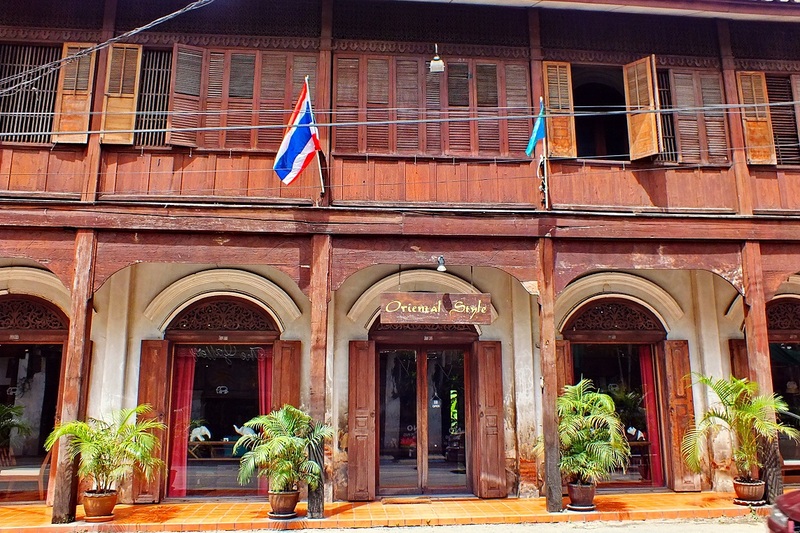 Chiang Mai city centre still has a large number of old buildings with teak wood villas and administrative structures such as the city hall built in an interesting blend of Victorian European and Thai styles such as the city hall. Stroll around the district around the city hall with its museum, old post office, and schools with their distinctive architecture. The city centre is surrounded by walls and gates as well as moats which have been converted into parks. Best is to rent a bike to discover the centre, although crossing the ring road around the wall can be a bit challenging! How to get there: follow signs to Chiang Mai city centre. Opposite the Wall city and across the Ping River is Charoen Rat Road between the Nawarat and Nakorn Ping bridges. This community with its old teak houses lined along the road is home today to artist indie coffee shops, small restaurants as well as many art shops selling traditional Lanna textiles, design objects as well as sculptures. Pay a look to Wat Gate, a temple with a museum looking like an old attic as well as to the 137 Pillars House, a converted old Lanna style mansion belonging to the Borneo Trade Company, a British company trading teak wood. There is a small museum inside the five-star luxury boutique hotel telling about the history of the company. How to get there: walk along the Ping River, passing an American church to enter into Charoen Rat Road. Not far from the night bazaar along Chang Klan Road is the entrance to the Anusarn Night Market. The market is popular with Thais who flock there to purchase fried pork rinds and the extremely hot green chilli dip called Nam Prik. There are lots of giant food stalls as well, making the market a great place to have dinner. North of Tapae Road along the river, you’ll come to the flower market, where you’ll find roses, orchids and many other cut flowers on sale. The market is at its most active late at night. Impossible to be in Chiang Mai without going to Doi Suthep! 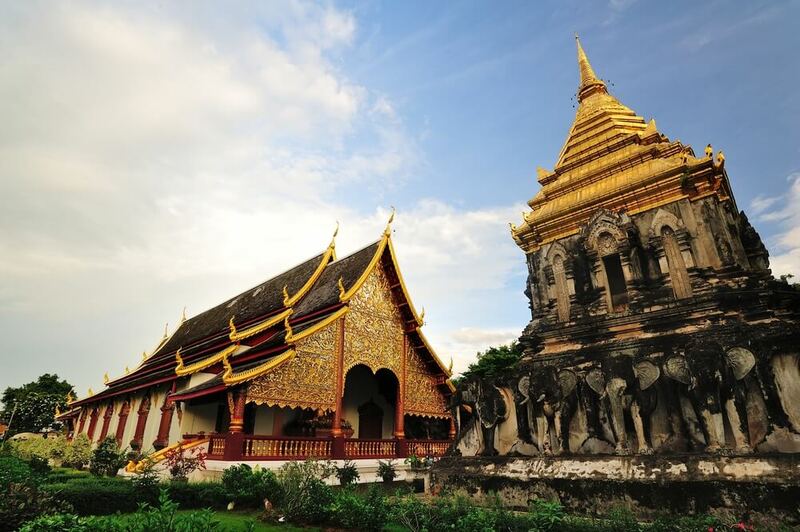 The very much revered temple is located over the city of Chiang Mai, half an hour away from town. It is a major pilgrimage destination during Buddhist holidays. The temple dates back from the end of the 14th century and for visitors, its appeal comes from its elegant golden chedi surrounded by golden statues of deities and Buddhas and from the amazing panorama offered over Chiang Mai city, when mist recedes over town. 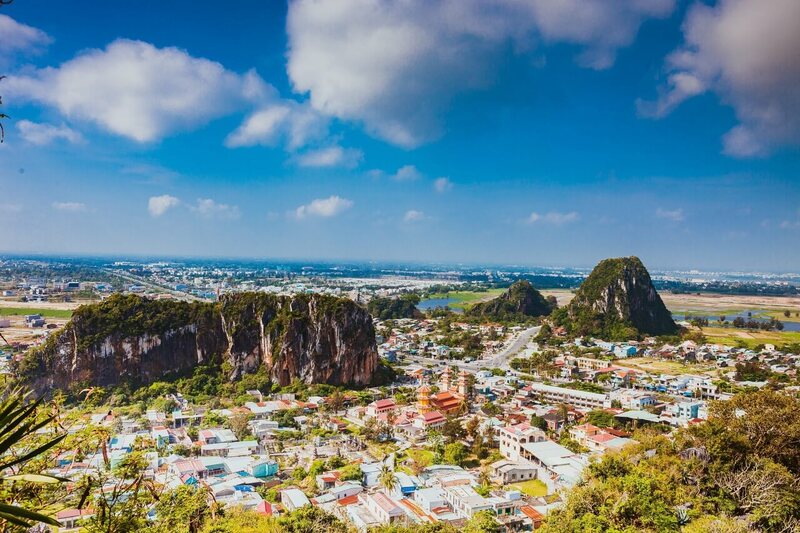 While there is a funicular to take visitors to the top of the hill where the temple is located, the most courageous travellers will enjoy climbing the 309 steps to the temple compound. How to get there: Songthaew (a small pickup truck) generally takes individual tourists to Doi Suthep from the small market area at the corner of Manneenopparat and Chotana Roads, next to Changpuak Gate and Central shopping mall. Just four kilometres away from Doi Suthep is a royal family residence called Bhubing Palace. Built in 1961 as a winter palace, Bhubing is well known for its lavish gardens which are open to the public when the Royal Family does not reside there- generally outside the months of January to March. The garden is then open every day. 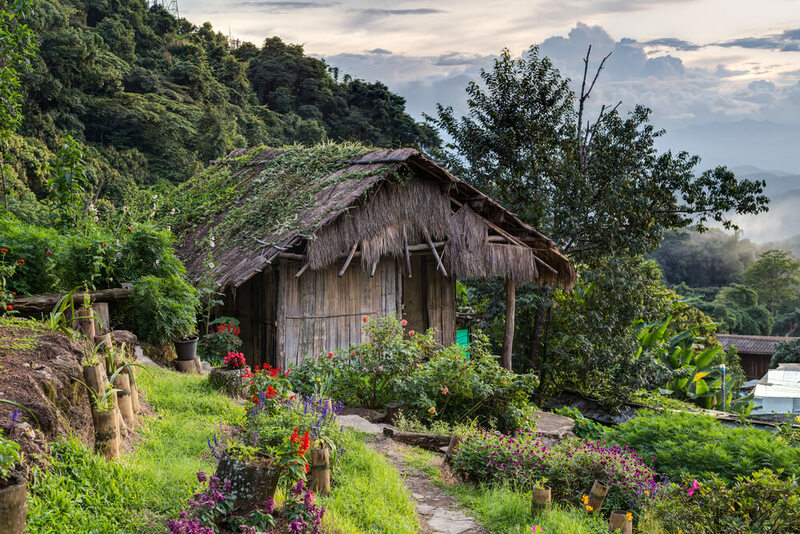 Another three kilometres away from Bhubing Palace is Doi Pui Meo village which gives a glimpse into the life of Hmong ethnics. The village offers wonderful views over Doi Inthanon. 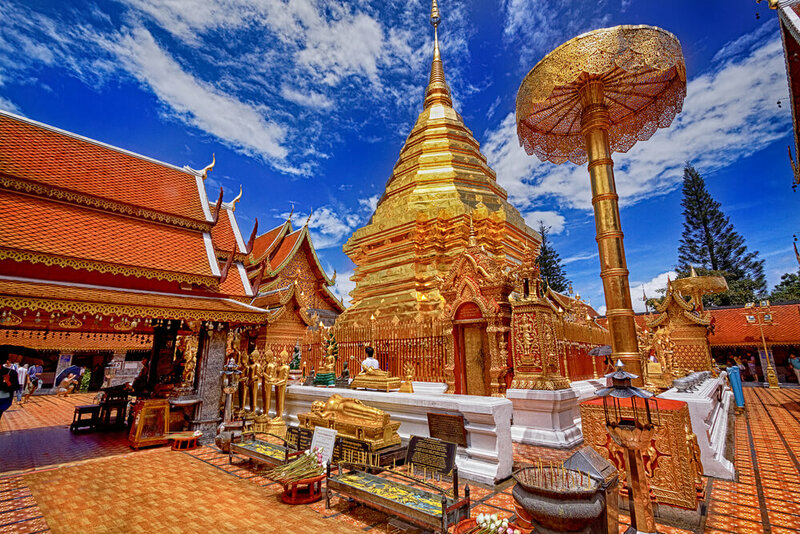 How to get there: Doi Suthep is located some 15 km away from Chiang Mai. The direction is along Highway 121 towards Amphoe Hang Dong. Add roughly 8 km for Bhubing Palace and Doi Pui Meo. 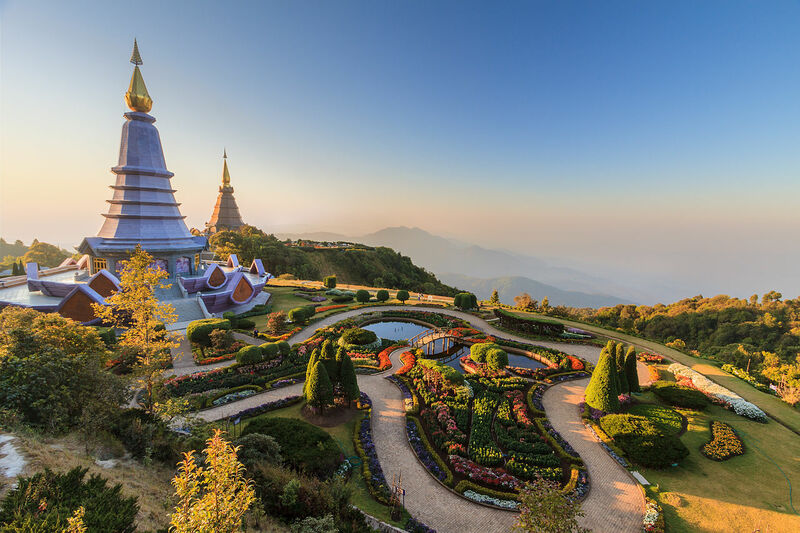 Doi Inthanon National Park in Chiang Mai is a must do visit, offering spectacular landscapes filled with lush jungles, green plains, and spectacular waterfalls. The mountain is the highest in Thailand standing at 2,599 m over sea level. Winters can then be particularly cold with frost often seen in December and January. There are many trek and hiking trails to follow inside the National Park. One of the most spectacular trails is the Ku Mae Pan trail, which lasts for three hours and goes through oak and fern forests, hills covered by flowers as well as waterfalls. The highlight of the trail is the arrival in front of the Royal Twin Pagodas, trekking along the Ku Mae Pan trail. The Royal Twin Pagodas were built to commemorate the fifth cycle birthdays of King Rama IX and Queen Sirikit. Among other activities at Doi Inthanon is the visit of Khun Klang Village, part of an agricultural royal project. There is also a bird watching centre with the possibility to observe migrating birds, particularly in winter months. How to get there: Doi Inthanon can be visited on a day trip as it is only located 100 km away from Chiang Mai. It takes generally two hours to reach the national park, going west of Chiang Mai. The easiest way to get to Chiang Mai is flying. 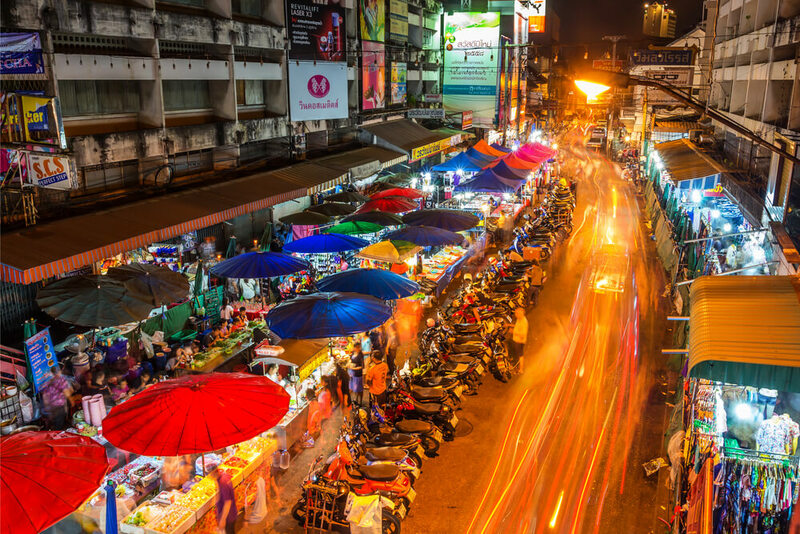 There are regular domestic flights from Bangkok to Chiang Mai or international flights from Vietnam (Hanoi, Ho Chi Minh), Singapore, Malaysia (Kuala Lumpur) and other cities to Chiang Mai. 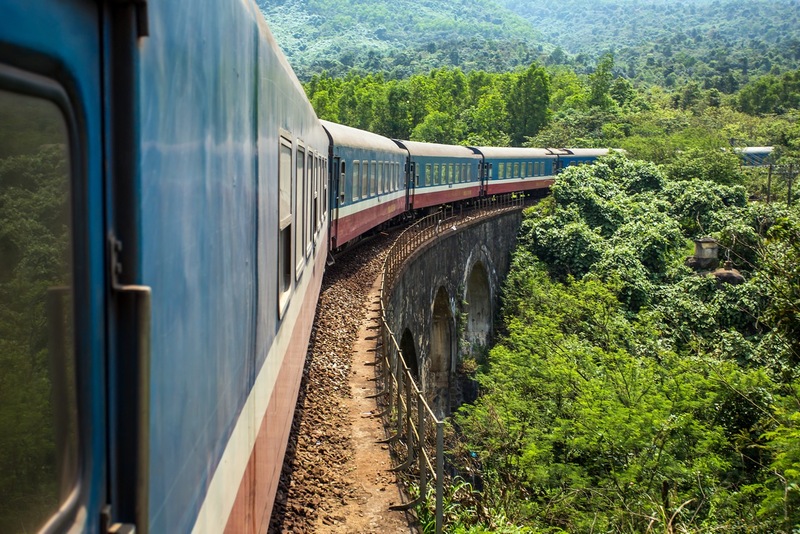 Alternatively, you can book online tickets for bus or train to get from other cities in Thailand to Chiang Mai. Baolau integrates domestic and international flights to Thailand to service online ticket booking to Bangkok in advance. Once the reservation is confirmed, customers will receive an electronic voucher that can be used to check-in and collect the physical ticket at the station of any departure point.